We first visited Bali with a baby when our daughter was just a few months old. 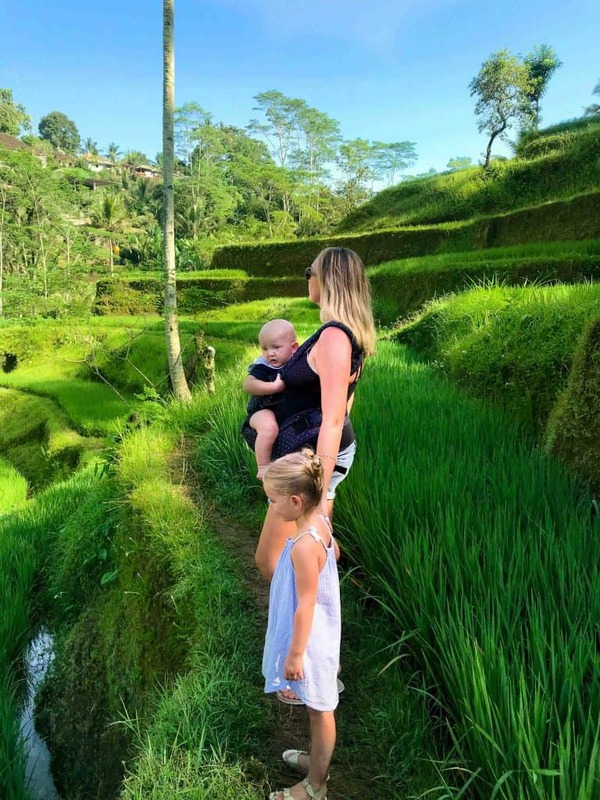 Unlike Australians, we had a long way to travel from Europe, so the second time we visited Bali with our two kids, we made the most of it by spending two months checking out what every corner of the island had on offer to families. 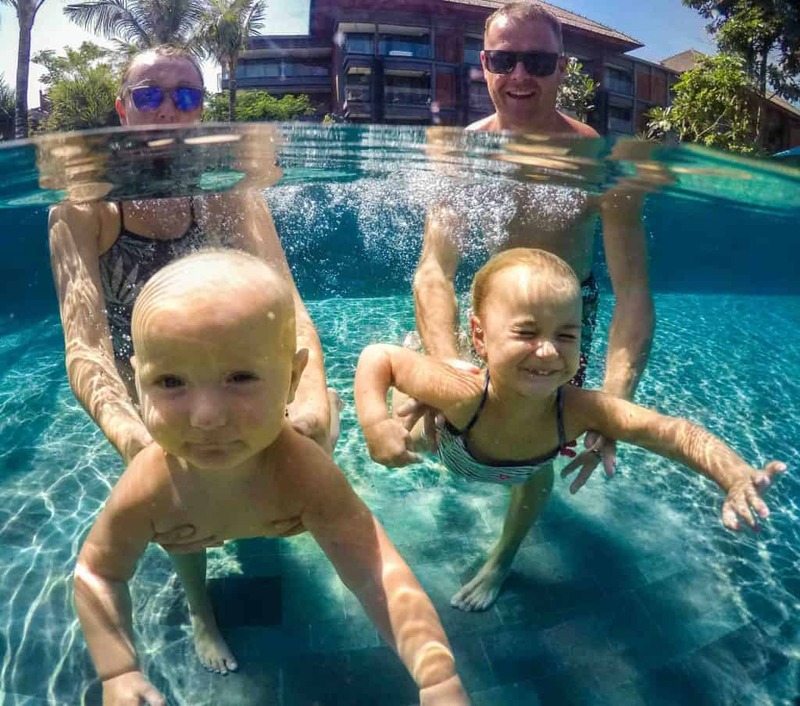 Needless to say, Bali is one of the most family-friendly destinations in the world that draws you in, and makes you long to return again and again! I can’t emphasise enough, how often we fantasize about our time on the magical island. Bali is an incredibly peaceful and spiritual place with stunning scenery and such diverse landscape. 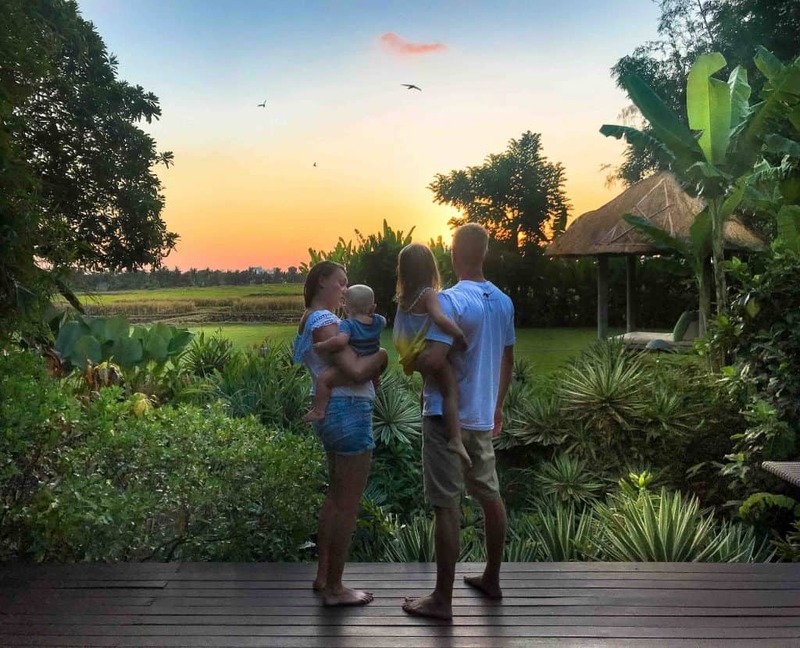 From the rice terraces of Canggu, to the rip roaring surf of Ulawatu, there is a tonne to see and do for all types of families in Bali. Whether you want to laze at a resort with an epic kids club, or do something like a family yoga retreat, we’ve tried it all first hand. I would go so far as to say I feel ‘expert’ in holidaying in Bali with kids! 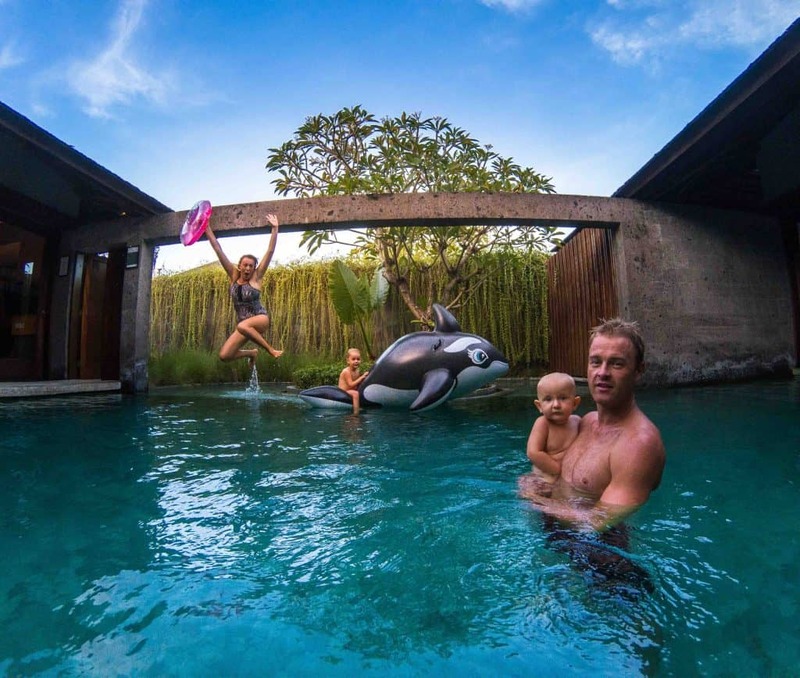 As a family, we love trying out lots of different experiences and we have the most diverse memories from our time in Bali. 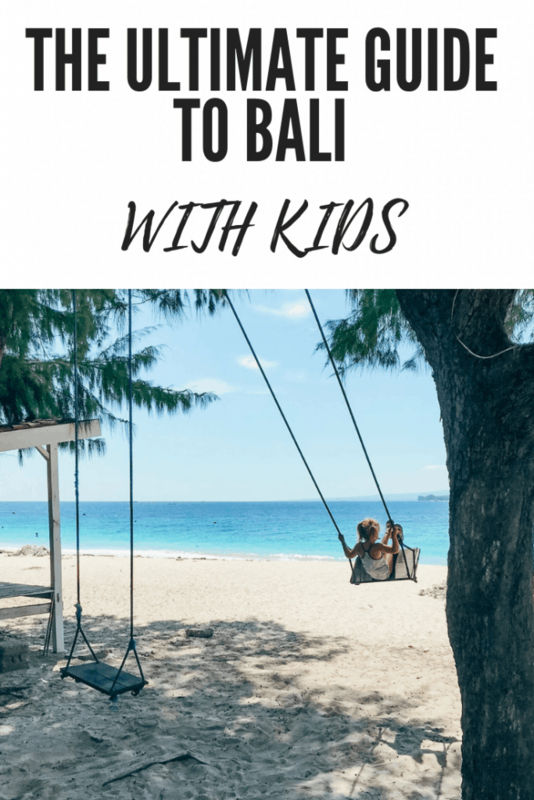 I hope you enjoy reading our ultimate guide to Bali with kids. My daughter and I enjoyed many a spa together, so many hotels in Bali are really onto it when it comes to kids. They cater to their needs and make them feel so special! 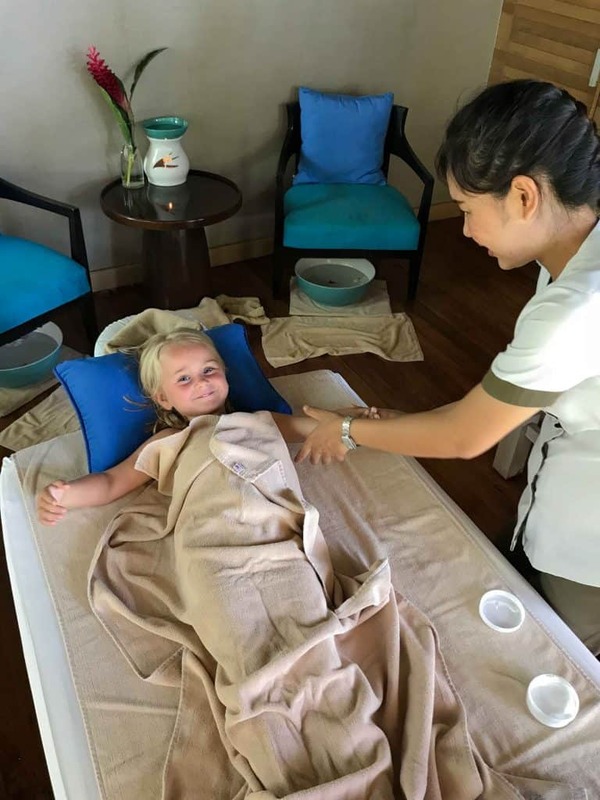 By far, the best place we experienced a spa for the entire family, and especially for kids, was at the Holiday Inn Baruna. Greeted with a kiddie sized refreshing welcome drink for Esme, and a mummy sized one for me, we started feeling relaxed immediately. Both Esme and I had a massage! From soaking our feet in water with floating frangipanis, to the head massage it was utter perfection. I’ve never seen my 4 year old look so relaxed, happy, and at peace. There are plenty of places you can go but this was our favorite. You can see the full details of the spa experience we had at Holiday Inn Baruna Resort here. 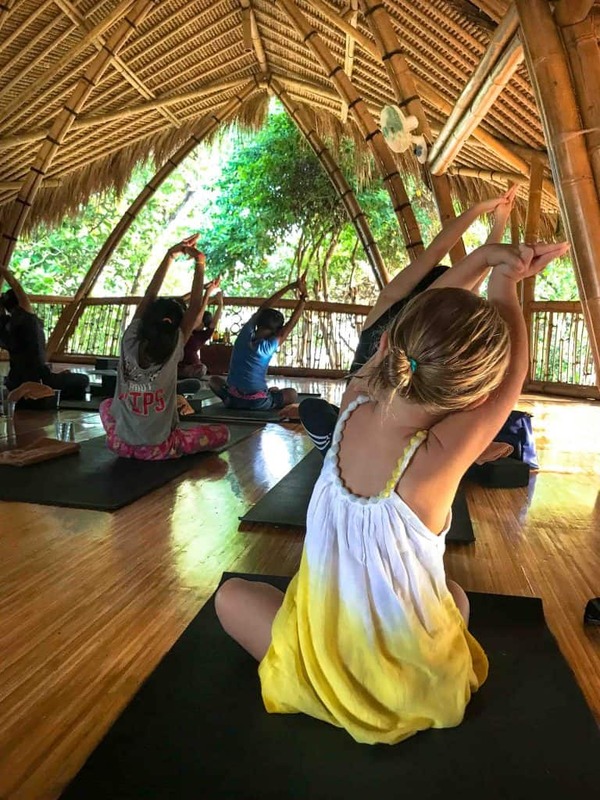 In keeping with the relaxed vibes in Bali, Esme tried a kids yoga class. Again there are plenty of studios that do a class for kids and many hotels provide it as an activity. However, it was the class at Power of Now Oasis studio, based on the beach in Sanur that we loved. The eco bamboo structure serves up yummy vegan food and juices whilst classes are held upstairs. The kiddies class is on once a week and all funds are donated to the local orphanage. I think that was an amazing lesson for Esme. Bounce Bali is an indoor trampoline experience with music. It’s a really good activity for days when it’s raining, especially if you are visiting during wet season. I found it a good workout for myself and Esme had lots of fun jumping around for a couple of hours. It’s based in the Canggu area of Bali. 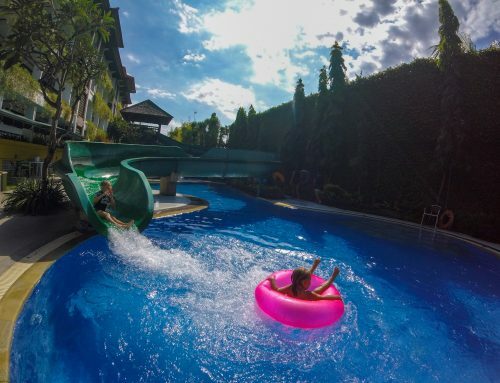 Waterbomb Bali is a popular spot among family holiday makers on the island. A waterpark full of all sorts of slides suitable for a wide range of ages, as well as swim-up bar and restaurants, a visit is a full day out! 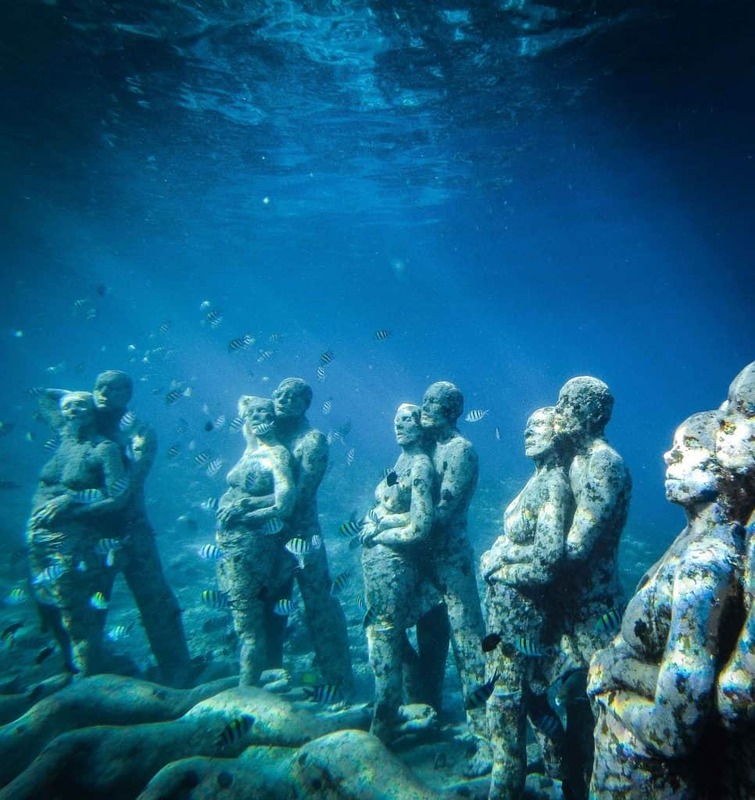 Another rainy day activity is the Dream Museum in Bali. Based in Legian, it is at the very heart of mass tourism within Bali. I’m not so crazy about the area but it’s a good activity. The museum is all about optical illusions and trickery, It has lots of three dimensional, life-sized murals perfect to get a few funny family selfies. Surfing in Bali is a number one activity, with so many beaches having surf, it’s a really good place to learn. Rip Curl Surf School on Sanur Beach take it really seriously and are very safety orientated. They have lots of nice new equipment and amazing teachers. Our daughter loved playing around in the white water but those kids who were more able went out to the surf on a boat with the instructors. I think it’s amazing to expose kids to these experiences, Bali is one of the best places to do it! 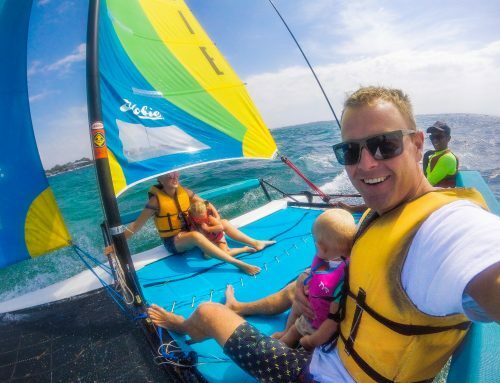 There are so many water sports in Bali, whether it’s riding on a banana boat, or sailing off the coast of Nusa Dua, kids can try so many things on most beaches. In some cases, water sports are included in an all-inclusive resort package. For example Grand Mirage Resort and Thalasso include sailing in their stay for guests. All you have to do is book in advance on your arrival and turn up on time! Our kids loved trying something new. The water around Bali is stunning with some places boasting surf as big as two houses. Similarly some of the quiet coves have stunning beaches. That said, the mainland is not always the best place to snorkel. 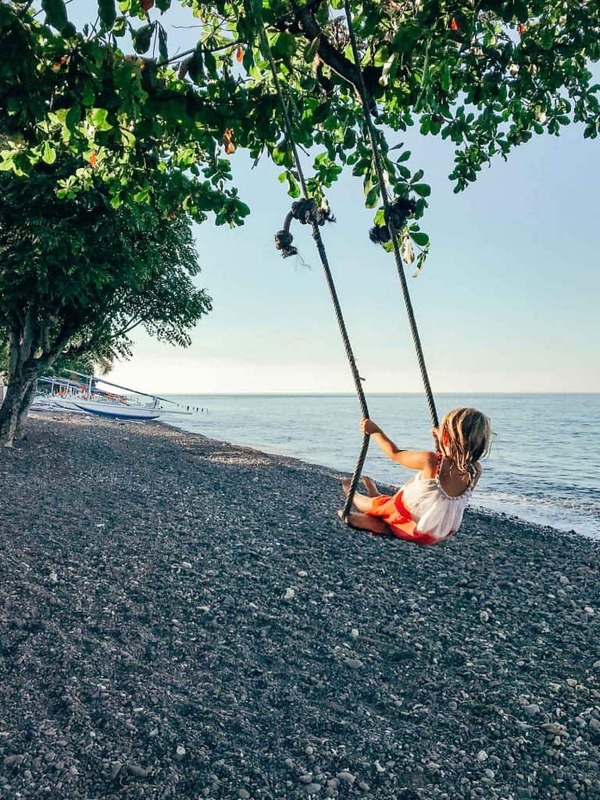 There are a couple of spots just off the beach in Amed and another close to Nusa Dua called ‘snorkelling point’ that is good for kids. 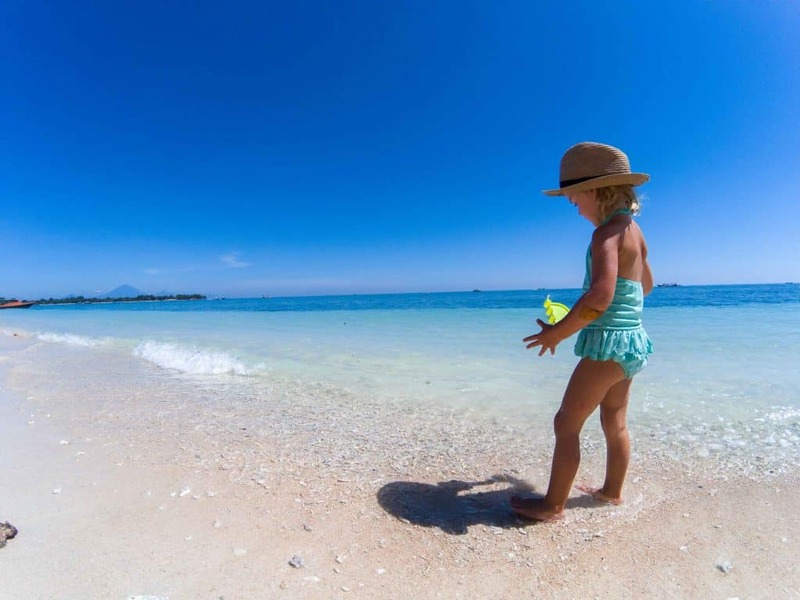 The best thing to do if your kids love to snorkel and admire the marine life is take a day trip to the Gili Islands or Nusa Penida. It’s pretty much guaranteed you’ll see turtles, an array of tropical fish and stunning coral reef. The Bali Treetop Adventure Park is an amazing place if your kids loves zip-lining and aerial fun. They accept little ones age 4 and above. It’s a full morning or afternoon of fun for the whole family. The activity is based in Bratan where there are plenty of other things to do, such as visiting the Botanical Gardens. 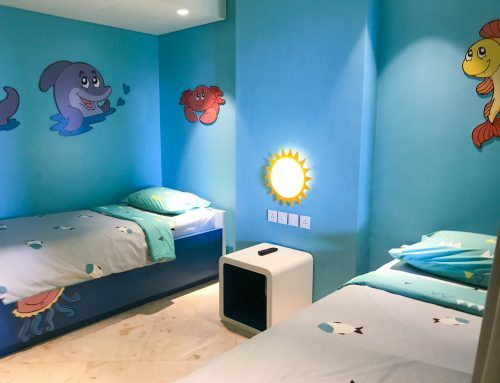 So many hotels and resorts in Bali have a kids club. We love our kids and I am sure they love us too, but the truth is they loved going to the club when we were in a resort. Most have an age limit, so those under 4 cannot be in the kids club alone. We found many offered a private nanny to mind them within the kids club if we wanted to do something ourselves. 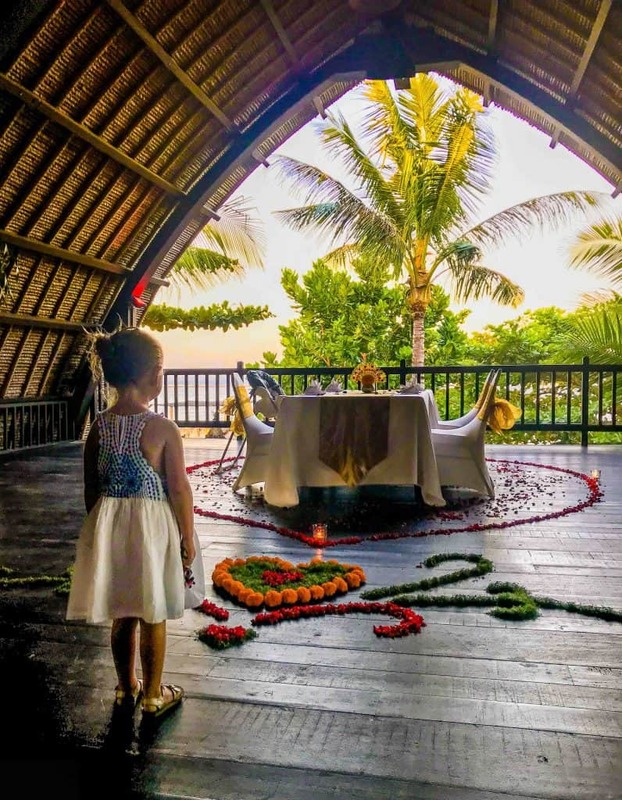 Out of the many hotels we stayed at, the best kids clubs were at Holiday Inn Resort Baruna, Holiday Inn Benoa, Prime Plaza Suites Sanur, Grand Mirage, Hotel Indigo Seminyak and Intercontinental Jimbaran. I have written this in order of budget for the stay from low to high! Pirates Bay Bali is a popular restaurant in Nusa Dua. It’s a themed open air cafe with lots for the kids to do. Recent reviews of the food have not been great but most parents online seem to think it’s still worth the trip for the kids. There are different events on all of the time so it’s worth checking out their website for an update. Everything form zip lining to treasure hunts has been on in recent months. 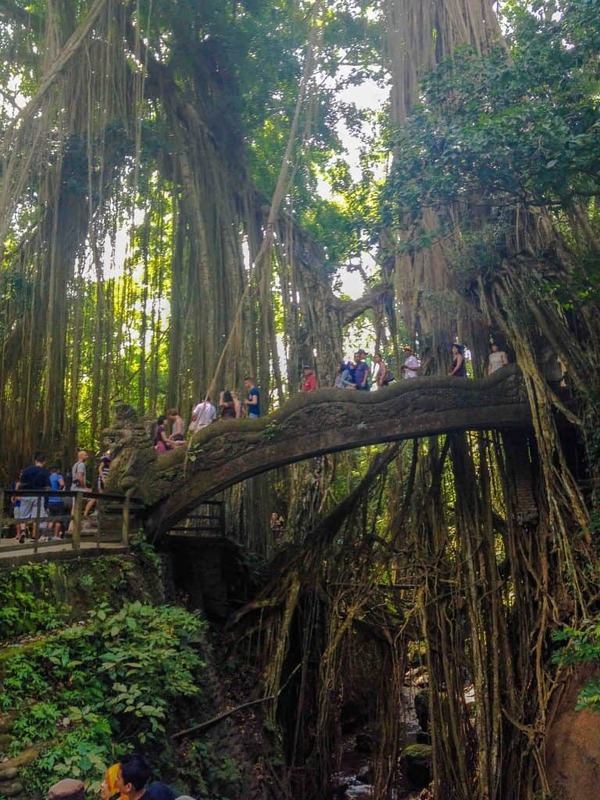 Monkey Forest is a stunning green area with winding paths passing temples and hanging vines. Based in the popular area of Ubud in the centre of Bali, Monkey Forest sees many tourists everyday. There are some very specific guidelines on the way in about not carrying food or having loose items. Monkey’s are thieves at heart and love to play around. My husband bought a bunch of bananas from inside (that’s allowed) the forest and I really didn’t think they would be interested in myself or the kids as we didn’t have any of food on us. My daughter Esme had a full set of monkey testes in her face when one decided to sit on her head. She was so incredibly calm about it all and just pushed him off. 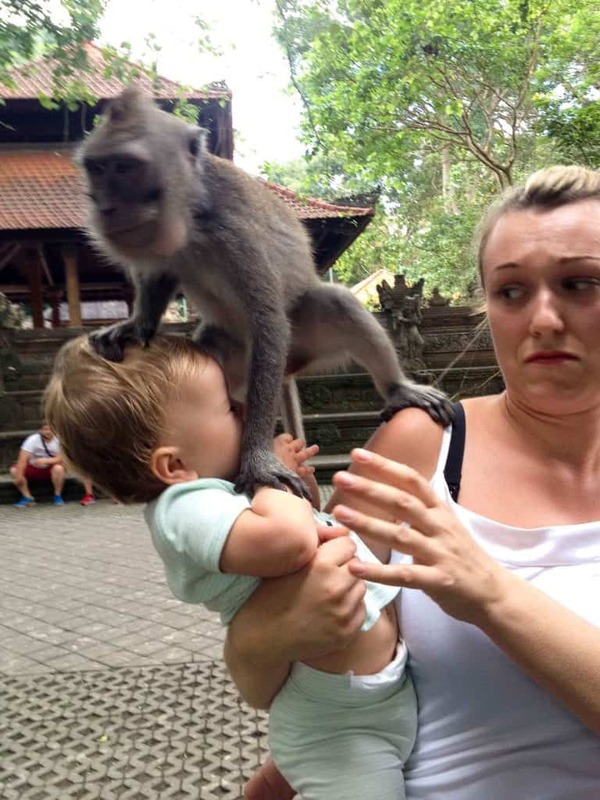 That said, take this as a warning as much as it is a cool place to visit, your kids need to be okay with monkey’s getting up close and personal. Likewise I have heard of a few cases where a monkey had bitten a tourist. If you go make sure to read all of the rules and follow them! We had asked for a lady to take a family photo on my phone and I had no idea she’d captured this moment until later on when I was scrolling through my images! There are so many places throughout Bali to take part in a traditional cooking class. We took a class at Holiday Inn Benoa in Nusa Dua. They were so inclusive with both myself and Esme and super accommodating with our vegetarian diet. We made lots of traditional dishes such as Nase Goreng, Gado Gado, as well as green pancakes. It was lots of fun and educational about local produce at the same time. There are tonnes of temples throughout Bali to visit but one of the most famous is Tirta Empul in Ubud. 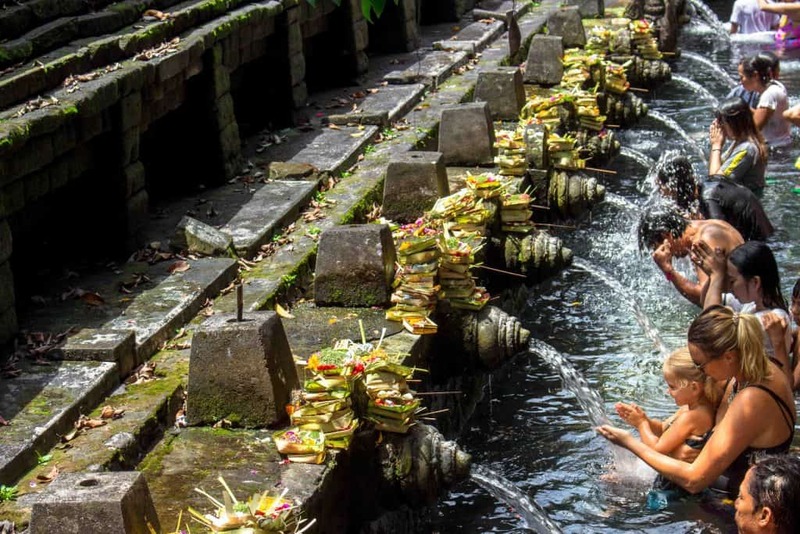 The temple features a water bath where Balinese Hindu’s go for ritual purification. Guests are given specific robes on entry to wear and there is a routine when you get into the bath to visit each of the water fountains. Kids are allowed and I found it a really enriching experience which through up lots of questions for our four year old. Ubud Palace has a renowned Balinese performance most nights throughout the week. Featuring elaborate costumes, intriguing performances and fire spitting, right on sunset. It is a really nice way to round the perfect day off in Bali. Our kids always love these kind of theatrical shows and the one in Ubud Bali does not disappoint. It’s really easy to get tickets as so many people are selling them outside the palace throughout the day. 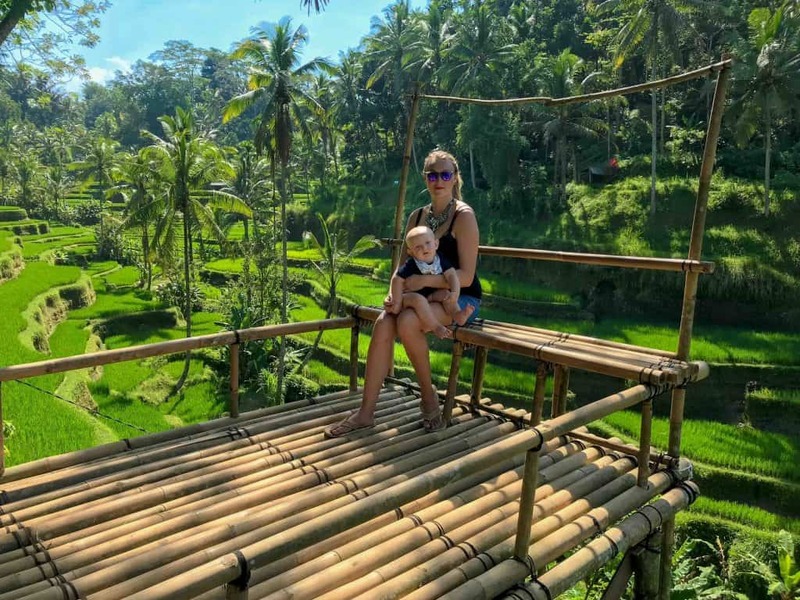 Canggu and Ubud have some stunning rice padis but one of the most famous and photographed is the Tegalalang Rice Terraces just north of Ubud. Whilst they are totally stunning there are many people there to get the perfect shot which distracts from its beauty. The good thing about Tegalalang is it has some swings amongst the rice paddies which kids love. They are harnessed in and can get some serious height if they like that kind of thing! 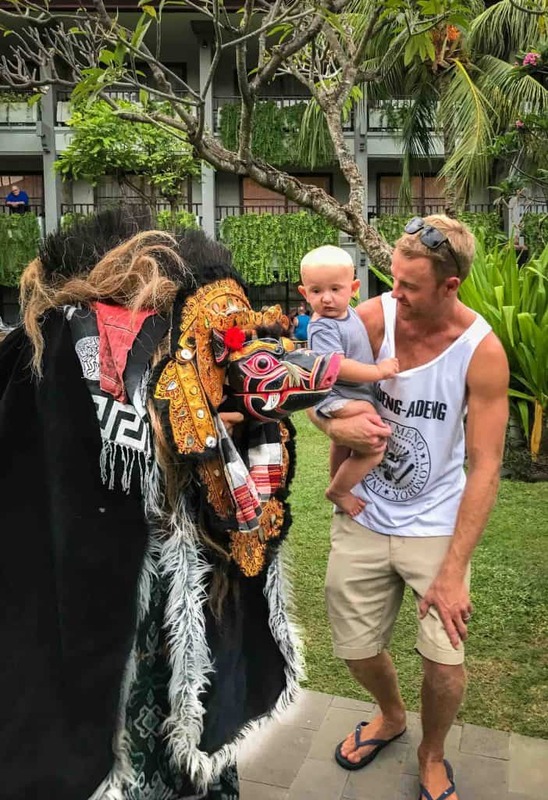 There are so many opportunities for kids to learn about Balinese culture and traditions just by walking around and exploring. From the many offerings, to traditionally dressed woman, Bali is abundant with rich experiences. So many places will teach kids how to make offerings and what they are all about. Likewise, Esme learned how to do traditional painting and tried on the local attire. 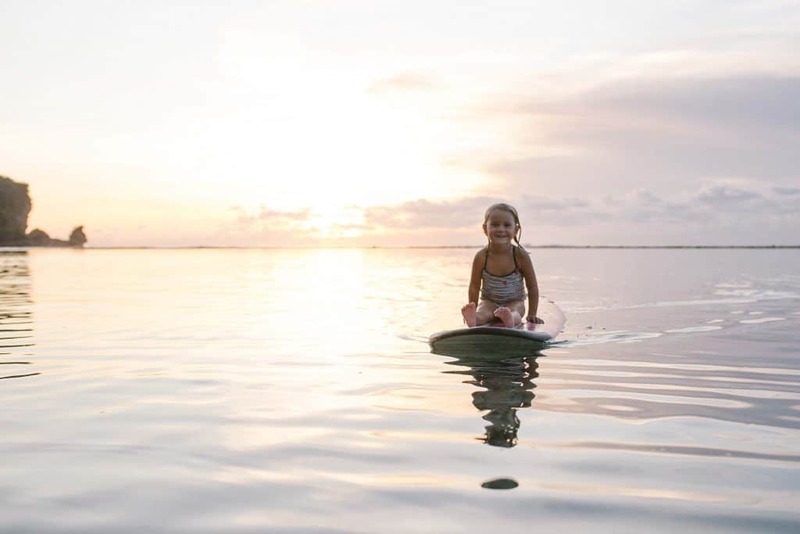 It’s definitely worth experiencing this side of Bali with little ones. Beaches in Bali sometimes get a bad rap. During rainy season storms bring in tonnes of plastic to some of the West Coast beaches. Likewise, some of the very touristy spots such as Kuta are not so nice. My best advice is to visit Bali in dry season and try to locate yourself close to one of the nicer quieter beaches if that’s the kind of holiday you like. My favourite beaches in Bali are Nusa Dua close to the water blow hole. The beach is pristine and there are a few other things around to see. The northern end of Jimbaran beach close to Intercontinental Resort is stunning. However nothing beats the beaches in Gili Meno and Nusa Lemongon. Although Seminyak Beach is very touristy with tonnes and tonnes of bean bags and chairs, I loved seeing the sunset in the evenings. My husband also loved the surf at Seminyak and often rented a board from a local. The beach is good for kids when the tide is out and I just loved the music and good vibes on Seminyak Beach. 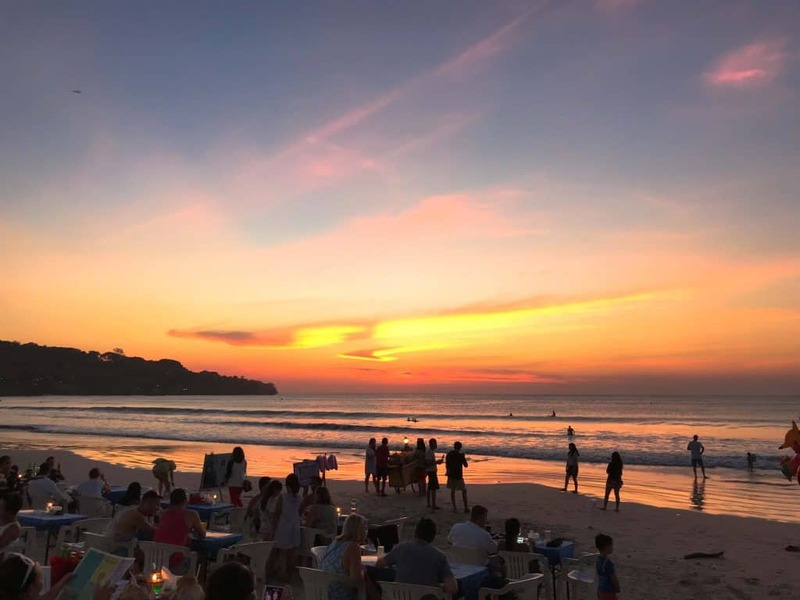 Likewise Jimbaran is another good place for sunset! The best part is the stalls that come out with fresh corn roasting in the evening. Our kids had them almost every night for dinner for such a good price! They were so flavoursome and one of our happiest memories is sitting there watching the sunset, our kids were salty and sandy from a day on the beach, chomping on yummy corn, whilst mum and dad had a beer. I don’t know of very many hotels in Bali that does not have a pool and needless to say it is a welcomed break from the intense heat. Our favourite pools in Bali are at Intercontinental Jimbaran, Hotel Indigo Seminyak and Bisma 8 in Ubud. I loved all of the features, from infinity jungle pools at Bisma 8, to all of the waterfalls and statues at Intercontinental, they were just amazing. However, our kids would tell you it was the pool at Prime Plaza Suites that they loved because of the water slides! 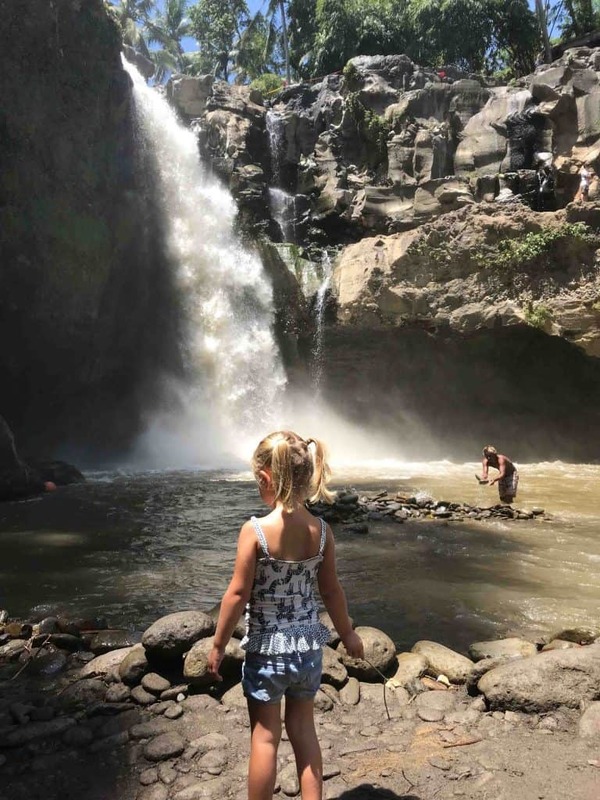 There are some stunning waterfalls in Bali that are worth exploring with little ones. We carried our little boy in a carrier on my back whist our older girl walked. She definitely needed her rock shoes and a little bit of encouragement but she loved the reward of cooling off at the end in the Tegenungan Waterfall in Ubud. If you want to organize a tour for any part of your trip we highly recommend checking out the vast array of tours offered by Get Your Guide! The best way to explore Bali is by moving around a little. The journey is never too long being a small island and it really gives an opportunity to explore so much more. Ideally spending time on the West Coast, in the centre around Ubud, and a couple of nights on the East Coast is the best case scenario. 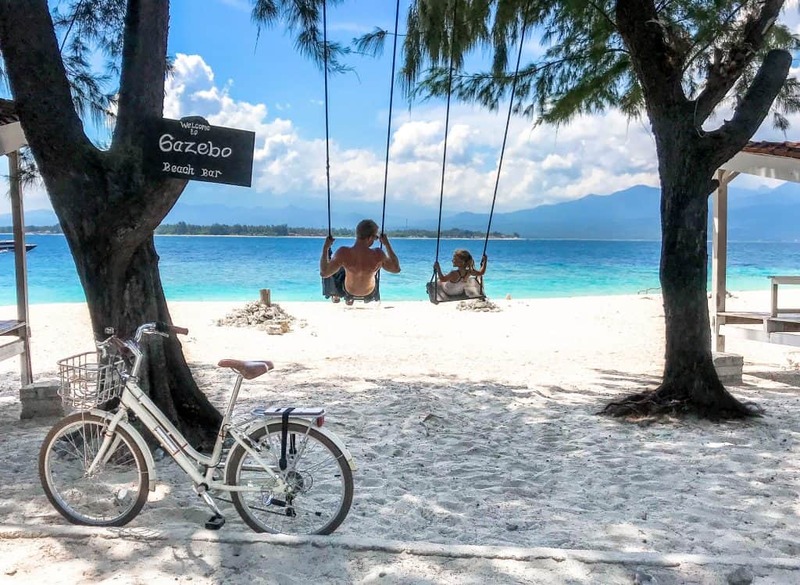 Although the Gili Islands are not part of Bali, they are easily accesible and many holiday makers incorporate a stay on one of the tiny tropical islands. Here is an overview of each area that we love! Sanur is a town on the East Coast of Bali, more popular with Europeans than neighbouring Australians, it’s naturally less touristy. The beach stretches for miles paralleled with a boardwalk making it perfect for a long stroll or a cycle. There are lots of resorts, villas and family-friendly hotels in Sanur. There are some amazing cafes, restaurants and yoga studios along the beachfront. Our favourite thing was to rent a bike and cycle around exploring. 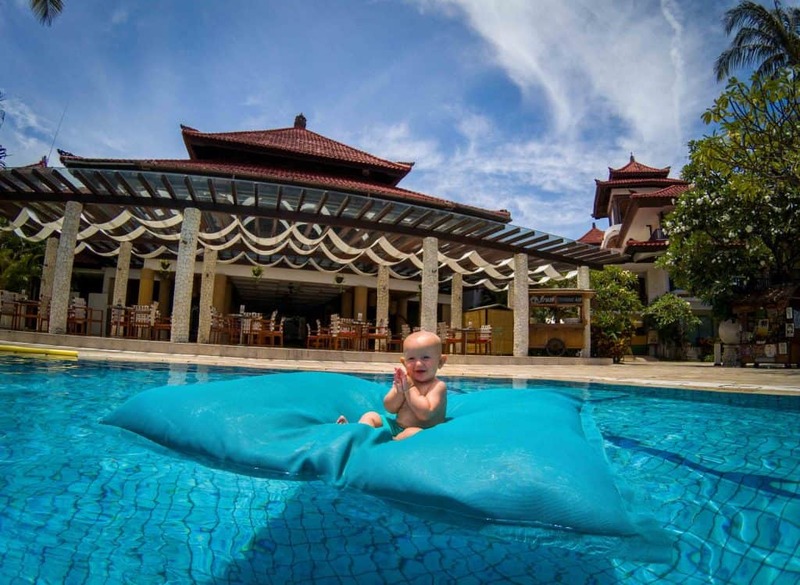 Check out the Sanur with kids article. I wasn’t too keen on the idea of visiting the Canggu or Seminyak area considering it’s so popular. That said, I ended up falling in love with both areas, particularly the healthy cafe scene. 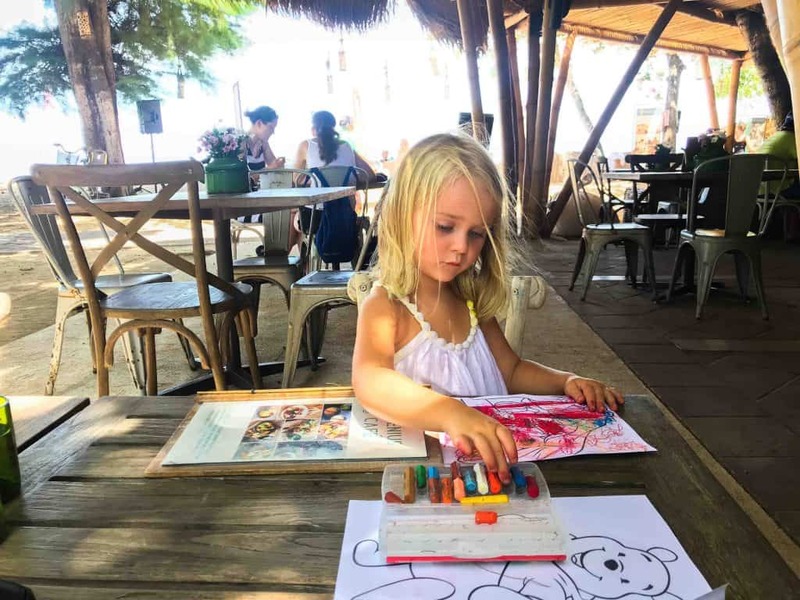 Some of our favourite restaurants were in Seminyak and our kids loved the places we stayed. We tried out a couple of villas. One was just north of Canggu, away from the crowds and was literal paradise. 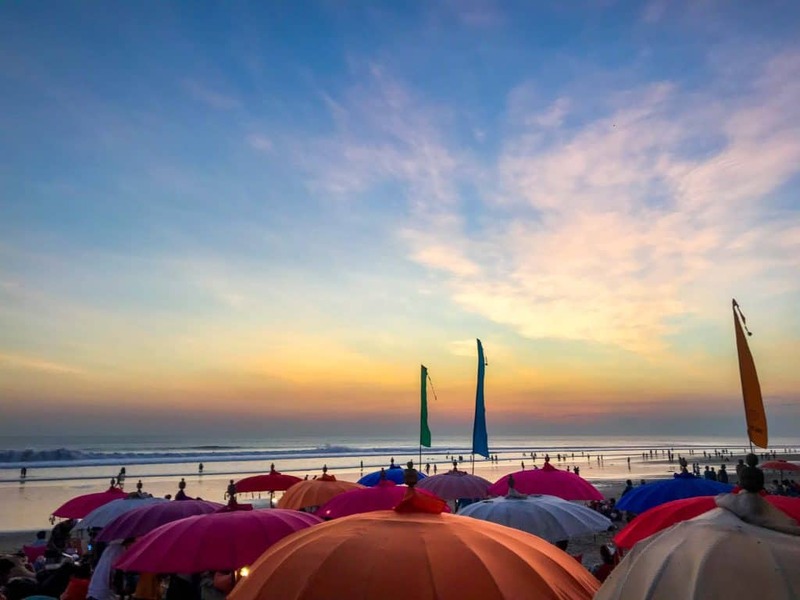 Canggu and Seminyak are the best areas to stay if you love the sunsets and for easy access to places like Waterbomb Bali and Bounce Bali. As we were in Bali for such a long time my daughter often attended The Garden Bali. It’s like an early learning centre with lots of outdoor space and indoor games. She loved attending! All round it’s a great base in Bali to access multiple attractions. We also found our dream home in this area! If I had my way, I would live my days out in Ubud! Based in the Balinese jungle, this vibrant and colourful town with serious zen is surrounded by dense vegetation and lots of wildlife. I love the market, the many relaxing cafes, the yoga, and the rice paddies just moments from the Main Street. Ubud is kind of touristy but it’s so easy to escape the hustle bustle by staying a little outside of town. From the Monkey Forest, Tegallalang Rice Terraces and epic waterfalls, to the spiritual water temple (Tirta Empul), Ubud should not be missed off any Bali itinerary. The ideal amount of time to spend here is around 3 to 4 days. There are plenty of things to do for the kids and some really family-friendly villas and resorts. If you fancy going off the beaten track and seeing the ‘old’ Bali, I highly recommend Amed. It remains relatively untouched with the odd hotel dotted through the landscape. It’s very close to some lovely rice fields that don’t see the same number of people coming through. Amed is about relaxing and soaking up the views. The beach is a rock beach so not ideal for sunbathing but many of the hotels and resorts have their pool pretty much on the beach. It’s one of the few places you can snorkel just metres off the beach on mainland Bali. We spent most of our time playing in the pool and just having quality time together at our villa! We spent a few day on both Gili Trawangan and Gili Meno. We loved both for different reasons but the main things was the shallow and beautiful tropical beaches with coconut trees shading our kids where they played for hours and hours. 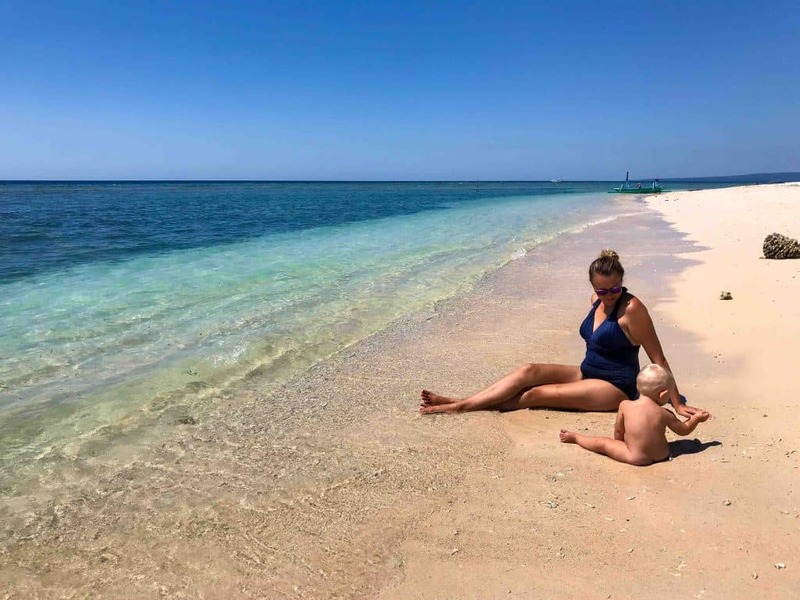 Gili Meno is definitely the quieter island and we found it attracted more families. We spent our time snorkelling, hanging on the beach and cycling around the island with our kids. We got a really good feel for island life! Gili Trawangan does attract a lot more younger people for the party. That said, we found lots of spots suitable for the quieter life and we also did our open water dive training in two days! The dive centre (Manta Dive) helped us with baby sitting. In the entire year we spent travelling full time with our children this was the one thing we wanted to do for ourselves. We did the theory in the evenings so we were only away from the kids for short blasts. They had lots fun spending time with someone else for a change of scenery. 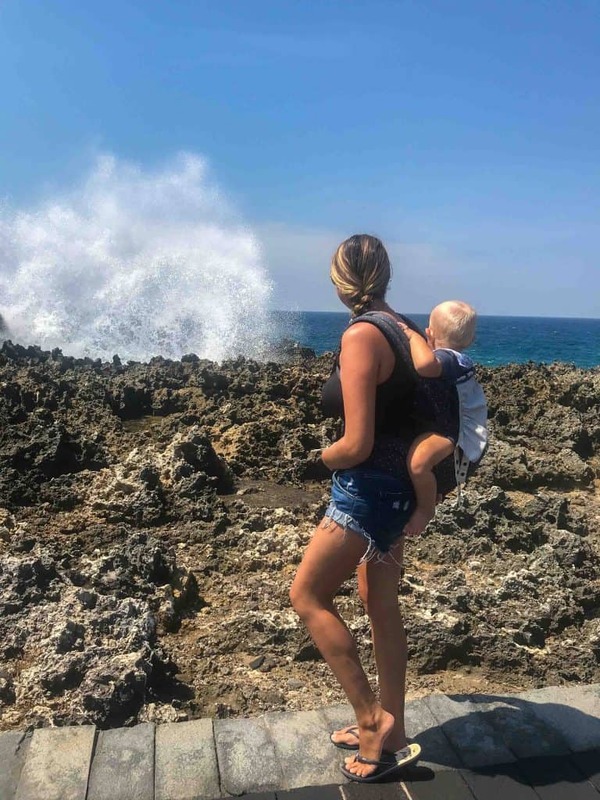 Back on the east coast of Bali, Nusa Dua is another beautiful area with stunning beaches and some amazing scenery such as the ‘water blow hole’. The light spray when walking past is so refreshing in the hot weather. We loved Nusa Dua, although it did feel quite away from certain attractions in Bali. We stayed at two family friendly resorts in Nusa Dua that our kids absolutely loved. The kids activities and amenities were amazing in both places. The Grand Mirage had lots of cool outdoor activities such as a climbing wall and sailing and also had an indoor soft play. 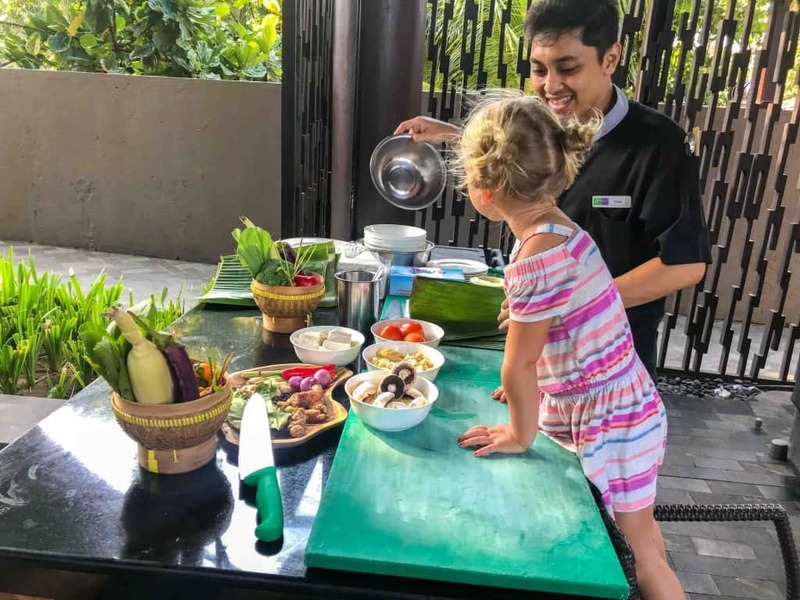 Whilst Holiday Inn Benoa had a really lovely indoor kids club and had special activities such as kids spa, pizza making and cooking classes. As I mentioned previously Jimbaran can be hit or miss with some people. As long as you stay to the north end of the beach (the bay is huge), it’s amazing. 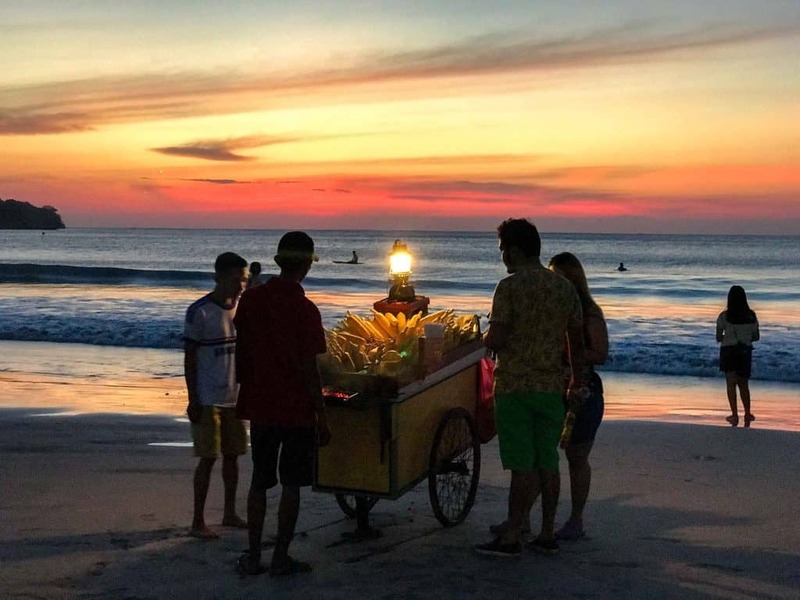 The best part is the evenings when people wheel their fresh produce out onto the beach, BBQing corn and other yummy foods. The steam and the aromas of the food with the sun setting in the haze is so magical! Jimbaran is a good place to stay if you have an early morning flight or need to be near the airport. On both occasions we’ve finished our trip with a couple of days in the area. 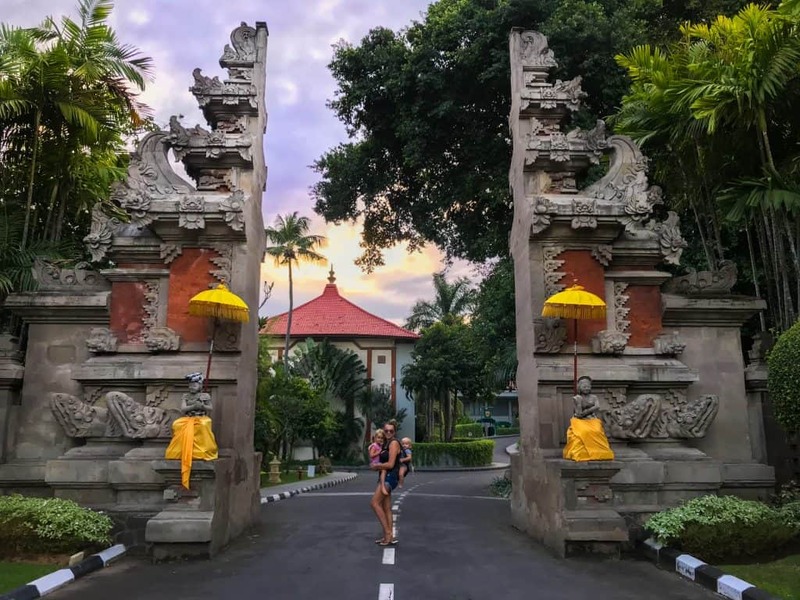 Intercontinental Bali Resort– We loved the location of this resort, especially with the epic sunsets and stones throw to the corn vendors on the beach. It featured multiple swimming pools with some beautiful statues and water fountains. The kids club had lovely facilities and the food was great! Holiday Inn Baruna Resort – We loved our time at Holiday Inn Baruna, there was so many amazing things for the kids. They had kiddie self-service breakfast which I found so cute, not to mention the Kids Club and the spa. The beach in front of this resort wasn’t as nice as other parts of Bali which is my only criticism of it! Holiday Inn Benoa Resort -This was a very similar resort to it’s sister Baruna noted above. They had the same facilities only the beach was better and close to some natural landmarks such as the water blow hole. Hotel Indigo Seminyak– I absolutely loved the authentic decor in Hotel Indigo Seminyak. They were really good at embracing the local cultural influences along with a luxury experience. The activities in the kids club were unique and really embraced local traditions. From kite making and kite flying, to Balinese painting and cooking, our kids loved the activities. The hotel is based on a really nice part of Seminyak beach with stunning sea views, I think its fair to say this was my personal favourite! Staying in a private villa is an entirely different experience from a hotel or resort in Bali. Just picture utter privacy, indoor outdoor living with a private pool a the foot of your bed. We loved the times we had with our kids just one on one time playing and relaxing, it never got old! Of course villas can be expensive due to their exclusivity but sometimes a bargain can be found. 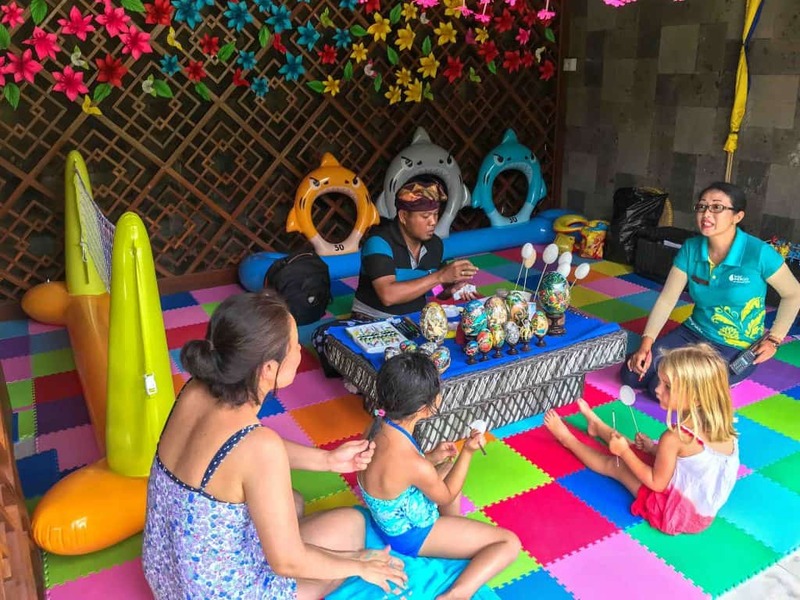 The Santai – Just a short distance from Seminyak is really amazing with kids. The villas are stunning and they bring the activities inside the villa with private classes and sessions. Our daughter loved face painting and the Balinese dance class that we did in our garden. Bali Hideaway Kemah Tinggi – This incredible private villa is not marketed on any of the major booking websites. However it is literally the best place I have ever stayed in my entire life!! I dream of going back again and again. It is expensive but has lots of space for a multi-generational family trip and I keep thinking it would be amazing to go there with my sisters and parents. The Hideway is totally hidden and is a vast open space with multiple buildings and bamboo structures inside. It has its own staff including a chef and they only charge the cost price for groceries and make whatever you like to eat. There is no service charge, it’s all worked into the overall price. I remember reading in their information book how they want to make every single persons stay memorable and special. They 100% catered to our children with a new box of toys on the lawn each morning, food prepared in a way that is appealing to kids and they always tried to spend time with them, it was truly amazing. There are a tonne of taxis in Bali. We have often relied on Uber or GoJek. However on our last visit we were increasingly finding there is a lot of tension amongst locals about tourists using these apps for a taxi. It’s severely undercutting their already very low price and obviously people are choosing the lower option. For me it’s often about the ease of using an app and not needing cash. Although it never happened to us, we heard of taxi men attacking Uber drivers and pulling passengers out of the car. So I would say until this behavior is settled, it’s best to use local taxis. I didn’t bring my kids car seats with me as we were travelling long terms and couldn’t take them to onward destinations. You can rent them from different companies, one named Bali Baby Hire. Alternatively, bring your own light weight compact such as Mifold. There are plenty of places to rent a car in Bali and that could be a good option if you will be moving around a lot. Rentalcars.com is a firm favourite of mine! There are two distinct seasons in Bali, dry and wet. Dry season starts in May and finishes in September, whereas wet season is from October to April. Many people say the best time to visit is just at the beginning or end of the dry period. That way, it is not in the middle of peak tourism. Of course there may be down pours of rain during the wet season but it can still be really lovely weather. Sometimes when the weather is stormy, it can wash plastic onto the beach which is not ideal. Despite there being clear differences in the season, the temperature remains fairly consistent. The average high is 31 degrees Celsius, whilst the low is around 22 degrees celsius. Sometimes it can feel incredibly humid, so it’s good to stay well hydrated and keep your skin covered with sufficient SPF. The first thing to consider when visiting Bali is to ensure you have sufficient travel insurance. I’ve always used World Nomads for my family. I’ve heard mixed reviews of healthcare in Bali. The care very much depends on proof of your insurance status. As long as you have a minor ailment, GP care is quite good and easily found. I had an ear infection at one point and found a really lovely Australian GP that saw me immediately and prescribed antibiotics. We have friends that had a negative hospital experience with their child so make sure you go to the best private facility with your proven travel insurance. It is really easy to find everything, from nappies and wipes, to kids snacks and suncreams. There are plenty of large stores around the island. Hardy’s in Sanur is pretty reliable for all your needs. We also found a Hypermarket amongst many others with western brands. I’ve had a tonne of people ask me since seeing us travel to Bali if it is suitable for baby and toddlers. The answer is absolutely! The Balinese are incredible with kids and I found them so helpful and friendly with our kids when they were really little. Whilst babies are quite easy going with the flow and fitting in, toddlers need age specific activities and facilities. Every hotel and resort had highchairs, cots, and a kids club with an area for smaller children where parents could stay and play. Bali is a really great place for children of all ages. Read my Bali with a Baby post here. There are quite a few places in Bali that rent baby gear, Bali Baby Hire is probably one of the most well known companies. Bali Family Villas rent out things like cots, high chairs, pool gates and so on. We rented a box of toys from them for one of our villas and it worked really well. It’s definitely worth considering for pool gates if you are in a villa. Australians and New Zealanders are super lucky to have direct flights to Denpasar. However for Europeans and Americans, the trip can be more complicated. From Europe, the best way to to get to Bali is via Singapore. Norwegian is a low cost carrier that flies direct to Singapore and airlines such as Air Asia also offer low cost flights to Bali. I personally prefer to make a stop for a day or two on route to break up the journey. Similarly, if you are flying from the US, you’ll need to make a stop in Hong Kong or China. 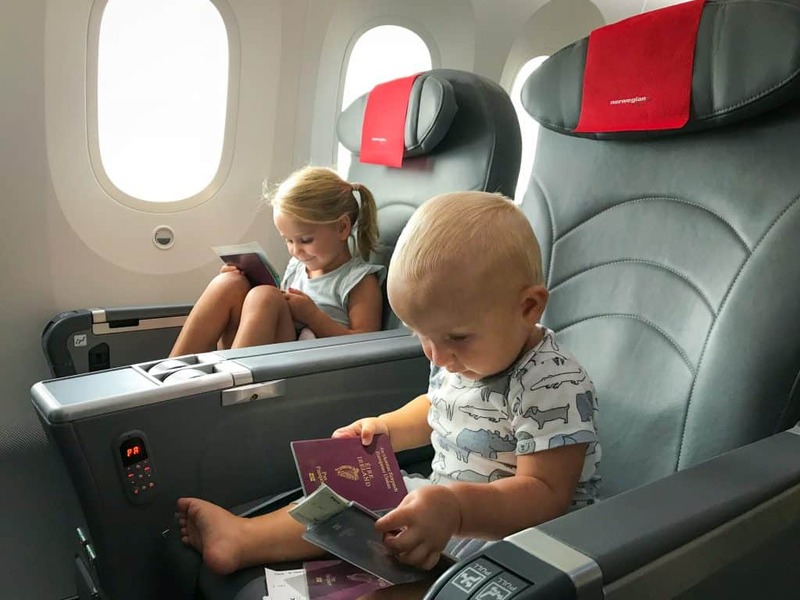 If you are worried about the long journey with your kids check out my guide to flying with a baby or a toddler on how to make it easier! The rules for visas in Bali is continuously changing. However more recently there have been two options at the airport for most passport holders. You can either enter on a 30 day visitors visa without any charge. However you must leave after the 30 days and this is something that is taken very seriously. Alternatively you can buy a visa on arrival that gives you the option to extend to 60 days. I hope you found this post about Bali with kids helpful. We love hearing from you so make sure to leave a comment or share this post and tag us! This post contains affiliate links. By using them we get a very small commission at no extra cost to you. Wow – so comprehensive. This has definitely made we want to revisit with the family. I was here 18 years ago and spend the turn of the millennium on Gili T. As I was travelling independently then I had no thought for what it could offer children and it is now firmly up there. What an amazing adventure! There’s so much to do as a family, so many experiences. Your pictures are so cute! 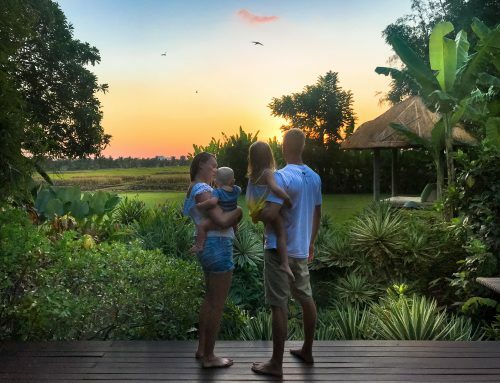 I never thought of Bali as a family destination really. Great to know there is so much to see and do there as a family! What an amazing guide to Bali. We’d love to visit it one day with our son and will definitely use your guide in our planning. Nothing like having the experts to tell you where to stay and what’s good to do in different towns. Oh my goodness, the kids’ yoga class! My daughter would be in complete heaven! I have been dreaming of our family Bali trip for so long, this gave me the best inspiration! Your daughters face in the message table…precious! She’s definitely living her best life.